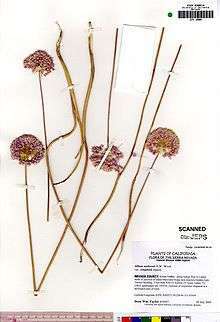 Allium sanbornii is a North American species of wild onion known by the common name Sanborn's onion. It is native to northern California and southwestern Oregon. It grows in the serpentine soils of the southern Cascade Range and northern Sierra Nevada foothills. Allium sanbornii produces a reddish-brown bulb up to about 2.5 centimeters long. Scape up to 60 centimeters long, bearing a single cylindrical leaf which is about the same length. The umbel contains as many as 150 small flowers, each with tepals less than a centimeter long, pink to white with darker red midveins. Anthers are yellow or purple; pollen yellow or white. ↑ Wood, Alphonso. 1868. Proceedings of the Academy of Natural Sciences of Philadelphia 20(6): 171.